A weekend visit to Austin and a little bit of a malaise led to a mini blog vacation for me. I'm not sure the cause of the malaise, but I just did not have the mental energy to write a post and malaise sounds like a good enough excuse to me so I am running with it. I also flubbed the recipe for the Easter post I was going to make and that put me in a bit of a bad mood. The general idea is still there, but I could not get it where I wanted it to be in time. Maybe next year. I have become somewhat adept at improvising Indian-style dishes and I am quite proud of that. For the longest time I had reconciled myself to the idea that Indian cuisine was just one of those cuisines that I would never be able to replicate at home. For one thing, it was the food with which I was least familiar and I only had it on rare occasions. There was one Indian restaurant in Austin that I knew of at the time, and I was hard pressed to find anyone willing to go there with me on a regular basis. After I moved to Chicago and discovered a few Indian restaurants in my neighborhood alone, however, all of that changed and I began to enjoy it regularly. But I still did not believe it was anything I could recreate. I knew true Indian cooking involved more than just throwing curry powder into everything. I would say that my spice cabinet was more broadly stocked than the average American cook, but the only Indian spice in there was curry powder. And I knew that was a shortcut spice, and not truly, authentically Indian (I was only half right about that), but regardless, it made everything taste the same, and I knew by then that most Indians made their own spice blends, depending on what they were making. And then I found a recipe that looked easy enough and only had a few spices. I did not have any of them, but ground coriander and cumin seed were easy enough to find. As I have written before, the asafoetida was a bit of a challenge, but the recipe said garlic could be substituted for that so I didn't even worry about it, until after I made the recipe and loved it enough to seek asaefoetida out at my local spice shop. After my initial success, I was inspired to keep going. Each recipe I made built on the ingredients I already had on hand, plus one or two new ones, so I never had to buy too many new spices at a time. And each time I made something new, I became more familiar with how the spices were used and how the flavor profiles were built. It wasn't long before I was grinding my own spices and making my own spice blends. And creating my own dishes. Like this curried sweet potato. This dish was born out the fact that I had some chapati dough to use up and nothing with which to eat it. I wanted something I could whip up fast. I had stopped at the store on the way home from work and grabbed a couple of organic tomatoes, some red onion and a sweet potato. From there it was a quick half hour to a hearty, satisfying dinner. I did not use every spice in my cabinet, contrary to what you might think from looking at the list. If there are any spices that you don't have, or don't like, just leave them out. Heck, you could even just use a tablespoon of your favorite curry powder and call it a day. I'm sure the result will be just as delicious. 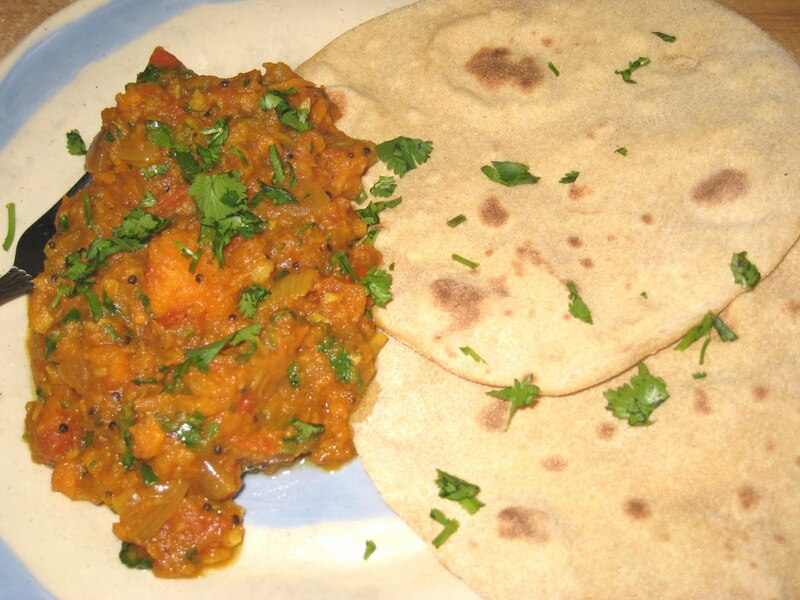 How did I make the chapatis? That's for another post. Place chopped sweet potatoes with cold water to cover in 3-quart saucepan and bring to a boil. Lower heat and simmer until just tender, about 10 minutes. Meanwhile, heat oil in large skillet. Add mustard seeds. When they begin to pop add the onion and cook for about 1 minute, then add garlic and ginger. Cook until the onions are soft and translucent. Add the coriander, garam masala, paprika, cumin, turmeric, cinnamon and cayennte. Season to taste with salt and pepper. Cook for an additional 2 minutes to let the spices bloom. Do not let them burn. Add the tomatoes and cook for another 10 minutes, until they have cooked down and formed a thick sauce. Add the sweet potatoes and the vegetable broth. Cook until the sweet potatoes are heated through. With a fork or a potato masher, crush the sweet potatoes to desired consistency, leaving them somewhat lumpy. Remove from the heat and add the cilantro. Serve with chapatis or rice and garnish with more cilantro.